Hurdles, or wattles, are transportable wooden panels, bound together by the weaving and wrapping of horizontal rods around fixed upright rods (aka ‘sails’). They are a geodesic approximation of a flat surface, a plain constructed of long round poles. We needed hurdles as flooring, as we were unwilling to import to the woods the only viable free alternative, unwanted pallets. While pallets are free and available, they all contain nasty old nails, and our promise to leave the woods with nothing that would not biodegrade, meant no iron-bound pallets. So hurdles it was. We were backed by extensive tradition, which we were keen to rediscover. 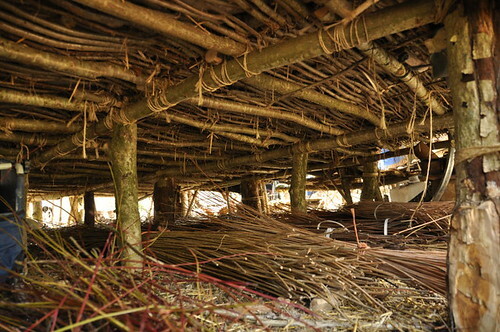 Wattle and daub is a historical catchphrase, and indeed formed one of the oldest building methods whose structures still survive. 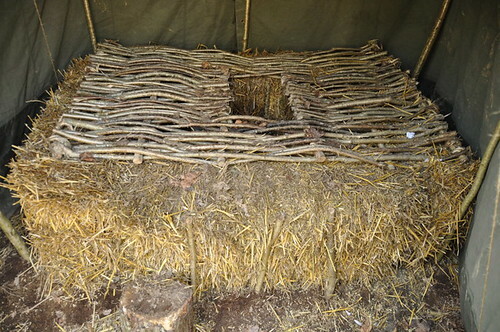 Wattle and daub, loosely, comprises of a hurdle (probably with unsplit rods, for greater longevity) being covered with mud, or clay, or cob, or poo. This seemed to work for generations of people in Britain, as a cheap, easy, effective form of house-building that used only abundant local materials. In fact, most of our traditional British industries (going back a distance) were dependent on the woodlands, our greatest land-based resource. This meant that people of these lands once took very seriously the production of suitable materials from the woods. 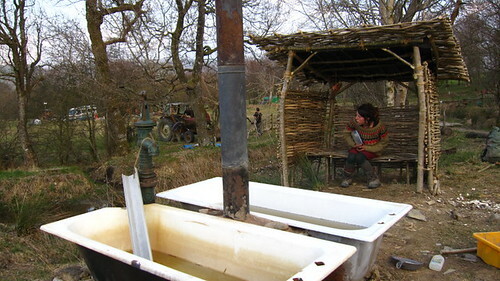 Hurdling, for example, requires lots of straight rods, and so woodland managment needed to provide this resource. By such prompts, or market-demands, was the system of coppicing developed. Coppicing is a word that is unknown in much of the world. It is the practise of cutting broad-leaf trees at various regular points of their lives, over a wide section of woodland, and then letting them grow back again. It has created man-shaped woodlands in Britain which, while not ‘ancient’ or strictly ‘natural’, are very old, very diverse, and very productive. It also created woodland-shaped humans, who were disciplined, observant, and diligent custodians of their wooded landscapes. Most people react strongly against a tree being cut down, and see it as an unnecessarily early end to a beautiful story. But in a non-fiction world, the coppicing of a broadleaf tree ensures its regeneration, that it may remain ever-young. Hazel, untended by man, will live for around 100 years, until it falls from its own weight, or rots, and in falling opens its base to the assault of microbia, insects, and fungi. But hazel constantly cut down to the stool, will live for 1000 years+. The same is true of many trees, although the method of regrowth depends on the tree. Elms sucker from the root. Ash grows above ground, from the stump. 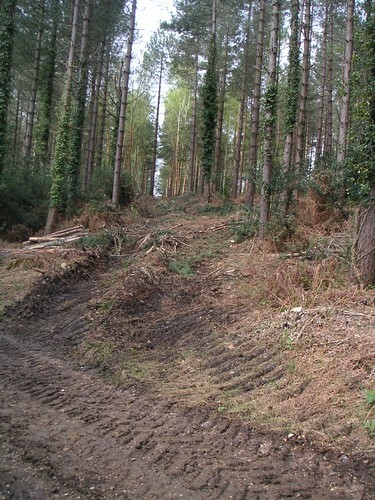 Conifers, native or otherwise, will not survive being felled. These days, when our ‘economy’ justifies the importing of timber grown a thousand miles away, as ‘cheaper’ than wood grown a mile away, old coppices in Britain are often left to rot of their own accord. Many woods are now privately owned, and their owners often espouse the belief that non-maintenance is good maintenance. And perhaps it is true, that in time old coppice woods will revert to a more ‘natural’ state; but it is also true that such a woods will be of limited value to builder-man. 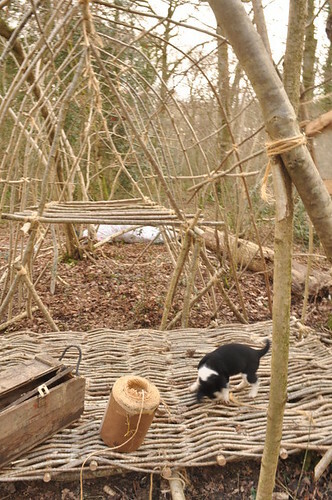 Coppicing, as a regulated cycle, provides materials for industry, as quick-growing small rods, or as longer-cycling of bigger ‘standard’ trees for timber. It also produces fire-wood, and charcoal from the littlest bits, and a good harvest of nuts or fruits (depending on the trees). But crucially, it also allows wide biodiversity, and a safe refuge for much wildlife. The piles of dead wood that are left in the woods become a valuable habitat. There were buzzards, tawny-owls, hares and woodpeckers in our patch. And because an area of coppice is worked in rotated sections (coups), there are all stages of growth in a functioning coppice. This ensures a regular dose of direct sunlight onto all parts of the woodland floor, to awaken wild-flower seeds who would not grow in constant darkness, like Foxglove, and to knock back the constant presence of shade-lovers, like Dogs Mercury. And because there is change, within a regular cycle, coppice woodlands allow the presence of what ecologists call a ‘guild’ of plants, meaning groups who are mutually supportive, and can live in conjunction without competing. Primroses, Anenomes, Bluebells and Violets form one such guild, which thrive on coppice floors. To our neolithic ancestors, the appearance of such wildflowers, especially two or three years after cutting, when the benefits of all that extra photosynthesis have been assimilated, would have given vital medicinal (and some edible) benefits. But these ancestors would doubtless also have delighted in the mostly-aesthetic considerations of the modern eye. The ancient (and recent) inhabitants of these islands valued local materials in industry and craft, having few other options. Their systems of woodland management would have been painstaking, always keenly observed, with a constant memory and respect for the working traditions that led them there. They duly learned that trees cut simultaneously over a wide area are more likely to regrow straight, as there is no sideways growth necessary in such an egalitarian competition for light (the only way is up). This was of considerable importance in industry, as regular materials are easier to work than lots of odd shaped and twisty bits. Also, on felling a single tree, many new growths emerge, so there seemed to be an ever-increasing wood to replace what was taken. This was probably pleasing to our projected ancestors, and perhaps we can imagine that such ongoing bounty was taken as a sign of approval, from divine powers, for the good act of coppicing. 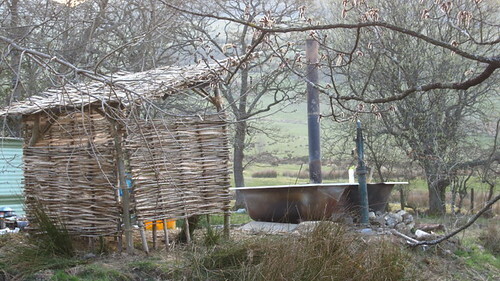 Of course, we have mainly out-grown such humility; but then, we’ve also mostly forgotten about coppicing. This island was once entirely wooded, and it is only humans who have altered this. We now enjoy approx 8.4% of England as woods, which to be fair, is an improvement on 200 years ago. But we have also suffered the massive increase of sitka spruce plantations, an Alaskan tree whose fast-growing properties make it the cheapest softwood timber to produce. Today, approx. 30% of trees in England are Sitka. While more trees is always good, such a boom of one species usually occurs at the cost of another, and native woodlands and coppices, whose format and scale are less economically rewarding, are the usual victims. So Sitka (and other conifers) are usually produced on the site of ancient woodland and coppices, which are grubbed (destroyed) in order to make way for more profitable pine farms. These monocultures of non-native trees are grown with little regard for biodiversity, and they do not coppice, but are cyclically felled and replanted. Much of this is due to the post-war ‘scientific’ forestry techniques championed by the newly formed ‘Forestry Commission’. We’ve heard many tales, from long-term local old-boys, of how local fishing streams became dead, brown and fishless, after the FC felled and sold the broadleaved trees, and replanted with soft pines. Today, much of this island’s remaining ancient coppice woodland is overstood, that is, in desperate need of regenerating, if the ancient trees are to live on, and if the culture of sustainable management is to be retained. 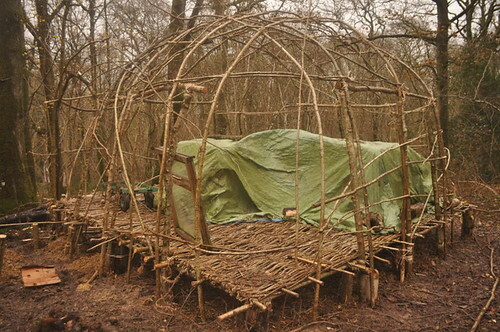 On arriving at our winter woodland base, we had coppicing on the mind, and were soon put to work on cutting down the hazel, as low to the ground as possible. 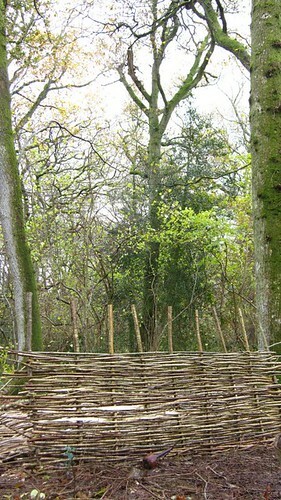 In 10-12 years, there should be a woodful of straight, bonny hazel rods, all ready for craft. But for us, there was instead a hodge-podge of twisty, gnarly stuff, with some good straight bits thrown in. This, however, is also a working benefit, as it ensures the woodland coppicer is always looking ahead, and planning for the future, for the houses of his grandchildren and onwards. 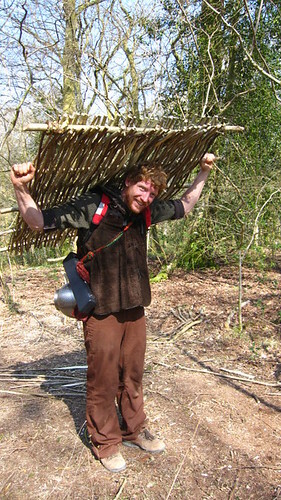 Luckily for us there were acres of woods to be coppiced, so our only shortages were in motivation, to hunt down the good straight wood and drag it back to camp. We tried making hurdles in our first days there, with Rose as a primary instigating experimenter (a role she played very well). But the mystery of how to keep the hurdles from falling apart, on every side, seemed impenetrable, despite books galore on ‘how-to’. Then into our camp strolled Hopper, who was a friend of the wood owners, and has been making hurdles for most of his life. It was his main career for many years, and he still makes them on order today, although he admitted that there is better trade in willow, which is easier to work. Hopper listened to our plans, and told us we were crazy, that a hurdle panel floor would take too long, and we should find another way. But he also told us everything we could need to know, should we decide anyway to pursue our unreasonable and unlikely plan. We found Hopper’s knowledge to be beyond expert. He is a born teacher, and could explain what he knew in simple and accessible ways. WE BELIEVE…it is the mark of a true professional, an artisan and an artist, for someone to be willing to openly share the “secrets” of their skills, without thought of recompense or competition. Anyone who refuses to divulge such information, a hoarder of knowledge, is (we surmise) a charlatan, afraid more to reveal their lack of understanding, than of losing their perceived information monopoly. But we may be wrong on that. So here is Hopper’s guide to Hurdle-making, as we heard it. A further instructional video, of Hopper teaching us how to split hazel rods, is available HERE. Please, as ever, ask any questions that you may feel prompted by this post, and its accompanying video. And please feel affected by all arising issues. We really want you, the person on the other end of the wire, to let us know what you know, about coppicing and hurdling (and unrelated other things too). We compile and release information not only for the outward education, but also to attract further (and alternative) knowledgeable responses. So share your findings, in the vital and wholesome arena of traditional woodland management, and we’ll all have a jolly dialogue. See you in the good old future. The crooked pieces of some woods, if stout enough, used to be used for various things, such as the “knees” in boat frames. I’d be interested in reading how willow may be used to similar purposes. We’ve got 700 hazelnut trees here in NZ and I am saving the trimmed bits to have a go at hurdling, we also have half a huge willow tree that came down in a recent storm so Iam going to have a go at mixing it, hazel uprights and willow weaving bits. We’ve just come by an overgrown hazel hedge, we’ll be laying it in due course but we will have a huge amount of smaller hazel whips and stems and this page has really whetted my appetite to make some nice things from them, thank-you! Loved your piece about hurdles and their uses. I’m in the process of developing our school’s outdoor learning envirnment and am keen to get the children involved in building fences etc. My problem is getting hold of the hazel in enough quantities. The coppices that used to exist in our part of the world for crab pot making have long been abandoned. Could you suggest any suppliers of the raw materials?